'White Light' ( Walter Welch, R. 1969). Seedling #T-520. MDB, 7" (18 cm). Color Class-W1W. Pure white self; white beard. ('Baria' x seedling #L-549) X unknown. Riverdale Iris 1971. From AIS Bulletin #201 April 1971 Introducing WHITE LIGHT (Walter Welch). MDB. 7" $5.00. Sdlg. T-520 (Baria x L-549) X unknown». We are privileged to introduce this latest creation by the unquestioned master of the dwarfs. It is a pure white self, including the beard, with a splendid flaring form. 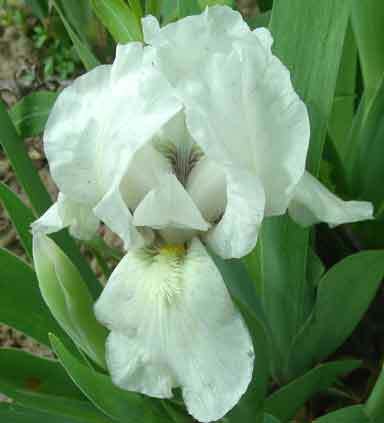 Riverdale Iris Gardens. jpg MDB White Light (RS).jpg manage 137 K 05 Oct 2017 - 19:34 HollyJohnson2017-04-01 MDB White Light. Photo taken by Holly Johnson at the Minnesota Landscape Arboretum, zone 4b, 5/10/2017.